Based on recent readings by myself and the real James of ILB, James Morrison, of Leaving Orbit: Notes from the Last Days of American Spaceflight, by Margaret Lazarus Dean and Ian Sales Apollo Quartet series, the latter of which does a very satisfying job of mixing alternate history with real Apollo hardware and jargon as well as making an concerted effort to describe what it felt like to be a part of it, to walk on the moon and hear your own breathing inside your helmet and your spacesuit, to have difficulty bending your knees or fingers inside that spacesuit despite the reduced lunar gravity. If I am including fiction I suppose I should definitely count the relevant Ballard Memories of The Space Age stories although I haven't read them all, because I think he also took pains to think hard about the real space program, albeit the filter of his unique imagination, focusing on it being gone, like Raymond William's on the organic society. The Margaret Lazarus Dean book mines a couple of interesting veins as she deftly compares her experiences watching space shuttle launches with that of Oriana Fallaci and Norman Mailer writing about the Apollo missions as well as befriending a NASA employee and his dad, a 30-year veteran of the shuttle program and respectfully telling the parts of their story she has access to. For me the parts involving the dad is some of the more interesting and affecting in the book,. After the good book with the title Moonshot, the one by Dan Parry, I read Moondust, by Andrew Smith, where he interviews all the surviving moonwalkers and tries to find out what it was like- rave review from Arthur C. Clarke and J. G. Ballard! Then Andrew Chaikin's A Man On The Moon, which is kind of a standard work that narrates all the Apollo missions which, although it has its longueurs when they are on the ground, does a really good job once they are in flight. Then the most excellent How Apollo Flew to the Moon, by W. David Woods, which goes into as much technical as you could want without reading the actual NASA manuals. Paged through Al Worden's Falling to Earth, saving up Mike Collin's Carrying The Fire, which is supposed to be the best of the "nose cone histories." Mike Collins. Lately my apostrophes have started floating in microgravity. Did not read Gene Cernan's book or Chris Kraft's, nor Deke!, although the last is supposed to be pretty good. Nor 2012's Forever Young. I've got to get that Oriana Fallaci book. I'd never heard of it before reading Leaving Orbit, but it sounds marvellous. James Redd, I can also recommend a film to you, 'Apollo 18', about a secret 18th Apollo mission, that finds hostile lifeforms on the Moon. Very, very good on all the 1970s tech and so forth, if a bit flawed because of being yet another "found-footage" movie. Another excellent book is Jed Mercurio's 'Ascent', a novel about a Soviet Korean War pilot turned cosmonaut who is selected for a secret Moon mission to beat the US. thx. Just read about two thirds of Ascent -can't put it down- and it is indeed excellent and perfect for this thread. The Korean War flying stuff reminded me a lot of the late James Salter's The Hunters, which obviously takes place on the other side of the Yalu River. Yes, I loved The Hunters, and Ascent really captured the same atmosphere well. Ten pages left - will he make it? That really hit the spot, thanks so much for Thw recommendation, James. My pleasure. it's a great book, weirdly little-known. But just beautifully done. read both leaving orbit and ascent on a long flight a couple of days ago - thanks for the recommendations, guys, i really enjoyed both of them. i'll be visiting the kennedy space center in a few weeks and leaivng orbit was the perfect prep. Please report back on your visit. I so want to get into the vehicle assembly building! You know, I first became vaguely aware of Mercurio when I saw his JFK book on the new arrival shelf in the library. Was not in the mood to read that one at the time and wasn't sure he would be able to make it work, but dimly recall thinking I would want to read the one about the cosmonaut. I just picked up a copy of Ascent from my local public library. Looking forward to being gripped. Have no idea whether it will be your cup of tea, but definitely interested to hear your opinion, as always. Started reading it last night. The Korean War has ended and our hero has just been banished to the Arctic. It is hardboiled in a way that I find only moderately engaging, as opposed to, say Hammett or Chandler, but I just finished 400pp of late-stage Henry James, so this is a welcome change regardless. It's short enough I am sure I'll stick to the end. You might prefer The Hunters. Salter writes of manly doings with little trace of macho posturing, having a warmer side that is pretty deftly managed, never feeling fake or forced. He is such good writer that it is kind of intimidating to try to say anything about him without feeling that one is not measuring up to his standard and damning him with faint praise. I enjoyed Ascent, but it was pretty obvious to me that the book was conceived as an ending in search of a beginning. Mercurio succeeded well enough in finding the beginning he needed that the book hops past some questionable transitions and gets you to the payoff ending. It's not the kind of book that requires pondering, so I won't inflict any on ILB. Suffice it to say I was adequately entertained. Glad you liked it even that much. read the first three of ian sale's apollo quartet and half of the fourth on another long flight, again thanks to this thread. i enjoyed the first two a fair bit, thought the third fizzled out a bit (and i wasn't entirely convinced by the characterisation of jerrie cobb, especially her christianity) and i'm struggling a bit with the self-conscious authorial interjections in the fourth. it's true he's definitely good on the tactile, sensory parts of spacefaring, but i wish he'd been a bit less obvious with flashing the fruits of his research via namechecking bits of equipment and endless acronyms. 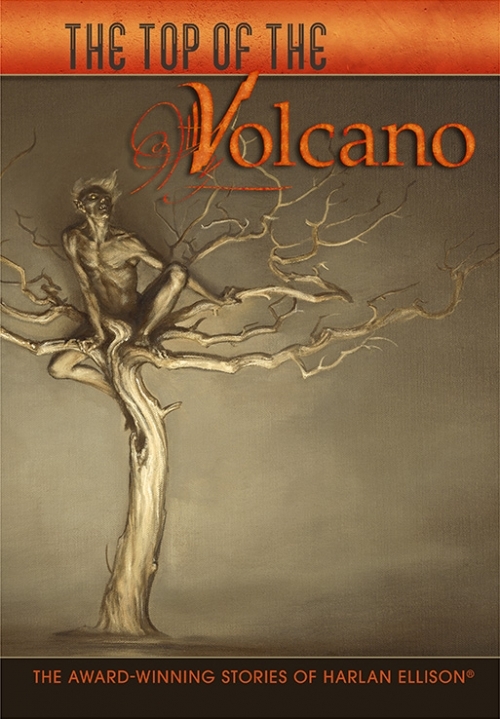 We've just received a number of copies of Harlan Ellison's The Top of the Volcano back from one of our wholesale account. Some are perfect, some are slightly worn. We'll put new dust jackets on copies to bring them up to snuff, and are happy to offer them at only $25 per copy, a wholly great price for an oversize hardcover that clocks in north of 500 pages. Lol. Just don't let HE find out or he just might try to shut us down. Agree that the first two AQ books were the best and that there was a dip afterwards. Third one veered close to being the most obvious alternate history 101 inversion and therefore seemed the slightest. Fourth one though I thought was a satisfying wrap up of the whole thing and brought together a bunch of interesting stuff- golden age sf, women in sf, astronauts and their wives and nurses and Vehicle Assembly Buildings. yeah, what better way to reverse global warming than a cold war? the cold war was prosecuted because the political and military leaders of the USA felt that the USSR was an existential threat to the nation, whereas climate change is merely an existential threat to the entire world. carrying the fire is fantastic so far - collins is a good writer with a dry wit, and he does a great job of delving into the roles each astronaut played in the development of apollo as well as explaining some of the technical aspects of spaceflight in an understandable way. i also rewatched my blu-ray of for all mankind, which never ceases to make me emotional. i'm off to the kennedy space center tomorrow. kinda think i might keel over at the sight of a saturn v or a shuttle. atlantis has its own building at the space centre, and nasa has carefully stage-managed your experience before you see it for real for the first time. you watch a short dramatisation of the shuttle development process, then a really gorgeous montage of shuttle mission footage on a massive screen. then the screen lifts and behind it is the atlantis, lit dramatically and tilted on its side with the cargo bay doors open. it's smaller than i'd have guessed but it's absolutely gorgeous, all flowing, elegant lines contrasting with a surface which is pockmarked and rough-edged from 33 visits to space. the sight of it hit me like a ton of bricks and i was instantly teary. i spent a lot of time as a kid reading and thinking about the orbiters - i was six when the challenger disaster happened and i vividly remember crying while watching it on the tv - but i was still surprised by how moving it was to see a shuttle for real. i have a million other pictures and things to say but this is too long already. it was an incredible experience and i loved every second of it. I am so envious. Lovely write-up! thanks! one more thing: I was convinced at first the mercury and gemini capsules we saw must have been scale models, but nope, they actually are incredibly small and claustrophobic. mike collins called the gemini 'a flying men's room' - doing 14 days in orbit in a space only very slightly larger than the seat you're in while having to go to the bathroom right next to your copilot seems like a special kind of hell. yeah, it's behind glass unfortunately. there is a little chunk of moon rock you can touch, though! i'm about halfway through deborah cadbury's space race: the battle to rule the heavens, which focuses on the work of wernher von braun and sergei korolev. there's a fantastic action-adventure movie waiting to be made about the race of the allied powers to track down and win over german rocket scientists after wwii ended, which cadbury goes over in detail in the opening chapters. she very effectively communicates the utter horror of the slave camps which produced the v-2 rockets, which i didn't know much about - 60,000 slaves worked on the programme, subsisting on 1,000 calories a day which the nazis calculated would keep them alive for six months. 20,000 of them died. the thought that the heroic age of manned spaceflight was built on the horror of slave labour is something i knew about but reading about it in some detail is still pretty horrible. korolev had quite a story iirc. the revered father of soviet rocketry, called "the designer" like someone's called the godfather, died of complications following surgery that could not be successfully completed because of injuries sustained decades earlier in the gulag. solzhenitsyn's the first circle a not-bad tolstovian novel about the relatively comfortable (as in, not actually designed to kill you) scientist-slave gulag camps. some truly nightmarish meetings about deadlines. the CHIEF designer no less! Apollo 18 is on Netflix but expiring on the 2nd, so watching now. Thanks for the extensive reporting, bg. Skipping 35 messages at this point... Click here if you want to load them all. Greatly enjoyed the first four stories I read this weekend in The Dream Life of Astronauts, which are set on Merritt Island and read like a mix of New Yorker stories written by a Southerner like, say, Padgett Powell, with Ballard's Memories of the Space Age. Which may not be quite accurate and will probably put you off reading it but perhaps I can describe better upon reading the rest of the stories. He was top of my list of Apollo astronauts I would have loved to meet. Such a quirky, enthusiastic, genuine-seeming person. There's some great stuff in NASA's historical archives, my fave is the oral history project - long interviews with everyone before they pass away A recent fave of mine are the 2004 interviews with Joe Engle - the X-15 pilot who got bumped from Apollo 17 by geologist (and later Senator and climate-change denier) Harrison Schmitt. More to the point, Engle talks about the life of being a badass-casual Air Force fighter/ test pilot - dogfighting & partying with Yeager, hand-wringing over stick-and-rudder vs. spam-in-a-can space travel, flight-testing every goddamn thing at Edwards, rolling the X-15, having to pee while you're in the middle of an abort, getting the phone call from Slayton, training for not going to the Moon and then finding a place in NASA and picking the Space Shuttle because it had wings and a stick-n-rudder. "Taschen teams up with NASA for an archival look into the great beyond"
some of the footage is of things you’ve seen a hundred times on tv but seeing it HUGE in imax and so pristine with the audio matching, it’s like watching it in real time, it was wild. and good lord all that 70mm found footage is glorious. We haven’t mentioned yet the thing about one of the space nerds involved in this being Feist’s brother. I forgot to say that the Apollo 17 video above is also directed / edited by Todd Miller and features Ben Feist's work; it's like a short form of how I expect the Apollo 11 feature will be. Cool soundtrack too. https://static1.squarespace.com/static/5744977b22482e4393b418c2/t/58ac8feb03596e6e757048f6/1537304200387/ This one? I have it on the way, will report when I get it. 🖼 This one? I have it on the way, will report when I get it. Not that one, sorry. I meant Shoot for the Moon, by James Donovan.